I know it's Easter Sunday and you're not supposed to put all your eggs in one basket, but I will assert that the Masters Champion will absolutely come from the final pairing. The Tiger/Phil show kicks off an hour ahead of the leaders at 1:35, and the opening act may well be more entertaining than the headliners. But if you think Woods or Mickelson can actually win, you'd better curb your enthusiasm. Angel Cabrera has 17 wins worldwide. Kenny Perry has 13 wins on the PGA tour. Both know how to close. Cabrera may be a little hotter, coming off a 69 yesterday. But don't underestimate the southern crowd cheering on Western Kentucky's good ol' boy Kenny Perry. 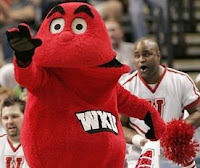 Besides, the green jacket would fit a Hilltopper nicely. Pretty, pretty, pretty...good. When TV coverage begins at 2 PM today, Tiger and Phil should be putting for eagle or birdie on the 2nd hole. Check in later for frequent updates. 7:22 ET Final thoughts are sad ones. Hate to see someone lose a tournament rather than win it. But what a day of drama. Cabrera's par save on the first playoff hole was both lucky and incredible. At 48, this was Perry's best and possibly last shot at a Major. 7:10 ET Oh my, Campbell's putter again. And after being all over the course, Perry and Cabrera survive with pars and head to 10. 6:50 ET Playoff preview. Campbell hasn't made a putt in forever. It was Perry's tournament to lose, and he might have with that finish. Cabrera is the Major champion in the group and I think he has the edge. 6:46 ET Holy cow. 3-Man Playoff. In 2005, Tiger finished bogey-bogey to let Chris DiMarco into the playoff, then Tiger birdied 18 for the win. 6:35 ET Campbell missed his birdie putt. Perry drove it in the trap. Cabrera could conceivably win this outright with a birdie on the last. 6:31 ET Kenny Perry picked a terrible time for his first bogey of the round. He heads to the 72nd hole, up just one on Campbell and Cabrera. Campbell has a chance to tie before KP tees off. 6:13 ET Now THAT is the shot of the tournament. A tap-in, near hole-in-one on 16 will give KP a 2-shot lead on Campbell, whose putter deserted him on the same hole. 6:05 ET Perry cleans up his birdie on 15. Campbell's great tee shot on 16 may make him a co-favorite right now. New round of fireworks coming home. 5:45 ET Tiger and Phil thrilled us all, but ran out of gas with a pair of bogeys on 18. Neither player ever led or tied for the lead today. Perry failed to take advantage on 13 & 14, so Campbell has an opening. 5:29 ET Looks to be a fairly pedestrian end to a surreal day for Tiger and Phil. Both hit terrible drives on 18. Campbell's back-to-back birds have him within one. Perry will likely make birdie on 13 though. Waiting for Tiger and Phil's warm embrace when they finish up. 5:18 ET The fire was a good thing. Perry birdied 12 to go to -12. Campbell will have an eagle putt on 13 to tie him there. Phil and Tiger have put on one of the greatest spectacles of all-time, but are running out of holes. 5:08 ET Tiger birdied 16 to get within one of Perry. He and Mickelson are now tied for 2nd place. Perry made his best putt of the day on 11, but just missed and threw his club. First sign of emotion/frustration/fire from KP. Good thing or bad thing for him? 4:55 ET Fireworks indeed. Mickelson's got an eagle putt to tie for the lead on 15. Tiger has a less-favorable eagle putt to get within one. But at the beginning of the day, they needed both Perry & Cabrera to falter, and thus far only Cabrera has. The last group still have both par 5s left on the back. Still Perry's tournament to lose. 4:38 ET Kenny Perry with a gutsy sand save & putt on 9 for a bogey-free (and birdie-free) front. He still leads by himself. Mickelson's got a chance at birdie on 14 to get back within one shot. 4:16 ET Wow. Mickelson put it in the water on the famed 12th. Campbell birdied 8 to tie for the lead for the umteenth time this week. Perry is still spinning his wheels. Cabrera's wheels are coming off. 4:07 ET Kenny Perry missed his best birdie opportunity. That makes 7 straight pars. Cabrera and Campbell haven't made any moves either. Mickelson has cooled off a little and it's still Perry's to lose. 3:55 ET Kenny Perry's 6th straight par still has him leading by himself. At the start of the day, I would have said 18 pars from the lead group may have done it. No longer. Lefty still may give a couple back, but is likely to pick up more than he drops. 3:38 ET A great scramble par by Lefty on 9, and he finishes the front side with a final round record-tying 30, just one shot back of the lead. Cabrera seems to be unraveling a bit on 5. Perry's still in very good position. 3:26 ET Phil is going from uncanny to unprecedented. Until his drive on 9 anyway. Gonna have some tree trouble. Sixth birdie on 8. Tiger eagled it, but also drove the woods on his tee shot on 9. Cabrera found the beach on 4 and Perry plods along, likely looking at another par. 3:17 ET First salvo from the lead group as Cabrera birdies 3rd to go to -12. He leads Perry by one, Campbell by two, and Lefty by three. 3:05 ET Now this is just uncanny. Mickelson's 5th birdie on the front nine has him just 2 shots back. Our solid veteran co-leaders both failed to take advantage of the par-5. 2:55 ET Mickelson is 4-under on the day thru 6. Can he keep it up? Golfers ahead of him haven't built any momentum yet. Both Perry and Cabrera hit poor drives on the par-5 2nd. 2:40 ET Looks like the fireworks are on, long before the back nine. Lefty's got 3 birdies in the first 5 holes, a pair of shots ahead of Tiger. 2:28 ET Steve Stricker, 4 shots back, just missed a gimme birdie putt on 1 - must be the dubious New York Stock Exchange logo on his shirt. 2:14 ET Mickelson gets the first skin on Tiger with his second straight birdie on 3. Lefty's at -6, now 5 back of the leaders. 1:43 ET If there's a 64 or 65 out there to be had, the early scores show no indication of that. There are 36 of the top players in the world out on the course, and the best score going is -2.